The Children in the Middle coparenting class was created by Bradley S. Craig, LMSW-IPR, CFLE and is offered by Between Two Homes, LLC. The use of the name Children in the Middle is used by permission from the trademark holder of Kids In The Middle® St. Louis, MO for use in the Dallas-Forth Worth metropolitan area including the counties of Collin, Dallas, Delta, Denton, Ellis, Hunt, Johnson, Kaufman, Parker, Rockwall, Tarrant, and Wise. 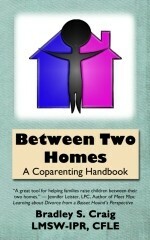 This website is Copyright 2012 © Between Two Homes® LLC. All Rights Reserved.